Added on September 24, 2014 by Aric Johnson. I am no longer a freelance designer and there were a plethora of reasons why I left the solo life (*cough* legit health insurance *cough*). As I moved away from my clients, I found they were hard-pressed to let me go. So for most of them, I offered to continue working on a “need only” basis (which loosely translates to a “most of my free time” basis). Back when I was 100% freelance, I quickly adopted cloud storage because it allowed me to share, organize, and backup important work. As a part of agreeing to anything contractual, I made sure my clients and I had shared cloud storage of some kind. I required them to 1) provide me access to their existing storage or 2) offered to create an account in the cloud storage provider of their choice. More often than not we chose Google Drive, because it was 15GBs, had email associated with it for additional communication, and productivity apps that made it easy for my clients to make revisions. I shared this idea with many of my colleagues (at the time I was getting a design related Masters) who were quick to follow suit with their clients. Not only did it make for faster work environment, it also made my customers feel more in control and connected to our projects. At my peak, I had 20+ clients I was consistently working with – which meant I had 20 different cloud storage areas with all my files. Having all that free cloud storage was great for business, but it made for an organizational nightmare at times. My preference was (still is) to work with desktop apps over browsers. But in order to work with multiple Google Drive accounts, I had to log out and log in with different credentials (same with Dropbox and OneDrive) and wait for all the files to be downloaded locally. I wasn’t about to waste my time or limited disk space doing this, so I stuck to the web browser. This left everything in my download folder, which required more steps to stay organized and still required local disk space. It wasn’t until I started working with my new company, a cloud storage company, that I realized there were easier ways to share storage. In winter of last year, we announced the beta for our newest product odrive which turned out to be the answer I had been looking for years ago. odrive lets you connect to all your different cloud storage (even multiple accounts on the same platform) and makes all that storage walk, talk, and act like local storage. Here’s what my work environment looks like with the clients I still have. All the folders are associated with the different storage accounts of my different clients. I don’t really care where the storage is, I just need my stuff when I need to work on it. 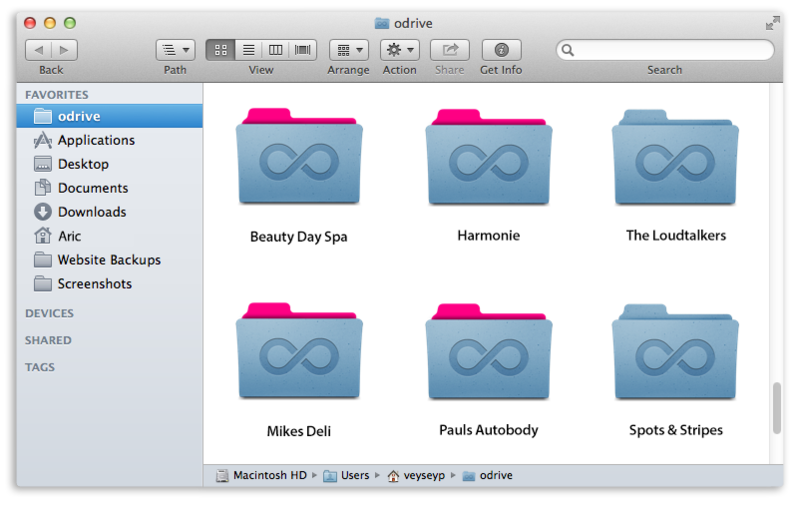 With odrive, the files are stored locally, so I can work on them locally. I make an edit. It saves to the cloud automatically. I work on video quite a bit and we all know video files can quickly eat up your disk space. I used to load everything onto my external drives to save space on my computer, now I put my free cloud storage to work. I can pick and choose files I no longer need and simply unsync them from my computer. They stay safely stored in the cloud and I can access them anytime I need them again. odrive makes me more legit and professional because I can work way faster and stay organized easily. Not only do I use it to work with my former freelance clients, I’m currently the resident media/web dude/graphic artist at Oxygen Cloud and use it to collaborate with outside vendors (because I too enjoy being closer to the work being done for me). Give it a try and post some comments about your thoughts, improvements, or any other needs you have related to cloud storage.